Explore grid-based visualizations of a subset of the cybernetics thought collective machine-extracted data. These visualizations include an interactive heat map, bar chart, and timeline. Explore vector-based visualizations of a subset of the cybernetics thought collective machine-extracted data. These visualizations include alluvial, cluster, and circle-packing diagrams. 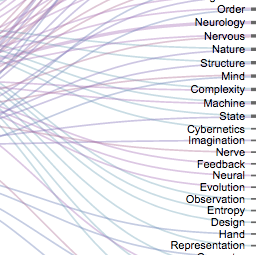 Explore a network-based visualization of a subset of the cybernetics thought collective machine-extracted data. This visualization was created using Onodo. The Cybernetics Thought Collective project has explored the use of automated annotation, entity extraction (i.e., extraction of concepts, names, etc. ), and network modeling techniques that utilize advanced machine-learning algorithms to yield network and entity relationships maps. As part of this work, we tested, explored, and assessed automated ways of creating metadata and revealing relationships among concepts and people mentioned in digitized documents from the papers of Heinz von Foerster, W. Ross Ashby, Warren S. McCulloch, and Norbert Wiener. Specifically, we seeded software with terms important to cybernetics, such as “cybernetics,” “cognition,” “homeostasis,” “recursion,” and “feedback,” as well as the names of cyberneticians and other scholars who were correspondents or mentioned in the correspondence and journals. This has resulted in machine-extracted metadata for each file, which is accessible through the digital collection (see metadata fields “Machine-extracted Feature” and “Associated Person”). Additionally, the project team used machine-learning tools to classify the digitized documents into broad categories as means to explore other connections between these cyberneticians and their archives. More information about the software used can be found in our GitHub repository. This metadata also forms the basis for the network and grid-based visualizations available through this prototype portal. The visualizations above represent a small subset of metadata for the files that were processed and analyzed during the pilot project. These visualizations were created primarily with Onodo, RAWGraphs, and Plot.ly. Some of these visualizations are interactive, while others are static. It is the hope of the project team that more data can be processed and added at a later phase. In addition, it is important to note that these visualizations are not the only way in which one can explore connections between the cybernetic subjects, people, and archival documents. Thus, they represent only one of many ways to to explore the data, but nonetheless provide a glimpse into connections that characterized the cybernetics thought collective. 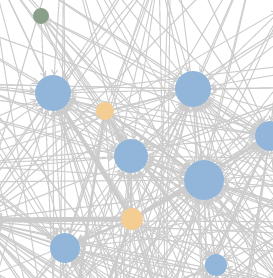 Click on the boxes above to explore the network, grid, and vector-based visualizations. The complete data set for this project can be downloaded here. Special thanks to digital project assistants Shreya Udhani and Brinna Michael for their excellent work making these visualizations a reality. The visualizations and data are licensed under a Creative Commons Attribution-NonCommercial 4.0 International License.